Gerard Pique acknowledged the absence of Lionel Messi will be a blow but insisted Barcelona can cope without their superstar captain. 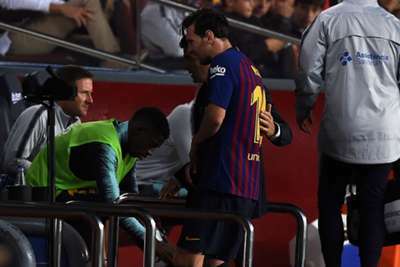 Messi will miss three weeks with a fractured arm after suffering the injury in Barca's 4-2 win over Sevilla in Saturday's top-of-the-table LaLiga clash. After setting up Barca team-mate Philippe Coutinho and scoring himself, five-time Ballon d'Or winner Messi landed heavily on his right arm before leaving the field in the first half at Camp Nou. Messi will sit out next weekend's Clasico against Real Madrid, as well as Barca's Champions League fixtures against Inter. "Psychologically we know that when he is there we are stronger but we cannot allow his absence to affect us," Barca centre-back Pique said. "It makes a big difference to have or not to have him but we have enough cover so as not to worry about whether he is there or not." "We will try to make sure Leo's absence is noticed as little as possible," Barca midfielder Ivan Rakitic added.